We service nearly all makes and models of vehicles, ranging from compact cars to large trucks and SUVs. T&M Cleaning professionals will even come to your home or work in West Allis, Milwaukee, Waukesha, Wauwatosa or elsewhere in Southeast Wisconsin, providing convenient pick up and drop off services for our clients. Our car detailing interior and exterior specialists have the same level of commitment to customer satisfaction as our housekeeping staff. You’ll get a consistently clean car after each service. From tree sap and scratch removal to deodorizing your vehicle and removing caked on winter salt, T&M’s automobile detailing specialists will have your vehicle looking showroom ready. Prices are based on the size of your vehicle. We’ll get your vehicle looking brand new. Our full car detailing services thoroughly clean the interior and exterior of your vehicle, using the best tools available. We’ll shampoo your upholstery and carpets, or condition your leather seats. A fresh interior scent will be applied. Your exterior trim, including tires and metal, is polished, and the paint is waxed and sealed by hand or with a high speed buffer. An extensive interior car cleaning using such items as toothbrushes, q-tips and air pressure. Upholstery & carpets are shampooed and extracted. All trim is dressed with low luster Armor All. Leather is cleaned and conditioned. Door jams are thoroughly washed, and trunks are also cleaned throughout. Fresh scent will be applied. Plus we’ll do a basic exterior hand wash for a fresh look. We also offer a thorough and extensive exterior vehicle detailing. Exterior trim, tires and all metal is polished & dressed. The painted surface is completely waxed and sealed by hand, high speed buffer, or both. Plus we’ll do a basic interior wipe down and vacuum. Paint cutting (compounding): A method whereby oxidation & minor scratches can be removed from painted surface. The vehicle must be polished, waxed, and sealed after the paint is cut. Prices vary according to the size & condition of the vehicle. Need your ride detailed but don’t have time to bring it to West Allis? No problem. For an extra $20, we’ll pick up the car at your home or work, clean it at our facility, and then drop it back off. Need corporate vehicles cleaned? We’ll make the whole fleet look like they just drove off the lot. 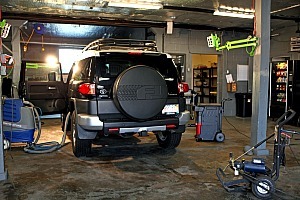 Our car detailers are dedicated to providing the best cleaning for your car. Schedule your auto detailing today. T&M offers cleaning services that match your budget and lifestyle. Schedule weekly, bi-weekly, once every four weeks or even one-time cleaning services from our professionally trained Milwaukee cleaners. We've been providing southeastern Wisconsin with quality cleanings for decades, find out why we're Milwaukee's best cleaning company. Contact Milwaukee car detailing professionals at T&M Cleaning Service today.